Is it possible to have a migraine more than 50% of the time? Unfortunately, it is. And it’s called «chronic migraine». An even MORE unfortunately, many doctors do not know how to diagnose chronic migraine. 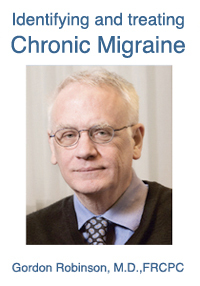 See what an expert, Dr Gordon Robinson, has to say about chronic migraine. This article has been written for health professionals and is available in PDF format. Do not hesitate to show it to your physician. Share the knowledge! Click on the icon below to access the PDF.